In 2017, Special Collections announced the acquisition of an important local history collection: papers of Eversley Childs (1867-1953) and family members who resided on Long Island, in New York City, and in Greenwich, CT. A segment of the collection, Lockwood family papers dating from the late 17th century, were received in poor condition. These fragile and brittle documents were sent off-site for restorative treatments from a team of professional conservators. Now, approximately half of the papers (more than 200 items ) can be read and used for research. Documents include original accounting records, land deeds, and correspondence from the period of the American Revolution. Many items concern the activities Eliphalet Lockwood (1741-1814), a captain in the Connecticut Militia, but geographic coverage extends into New York and Vermont. The second half of the Lockwood papers will be sent out for treatment later this year. 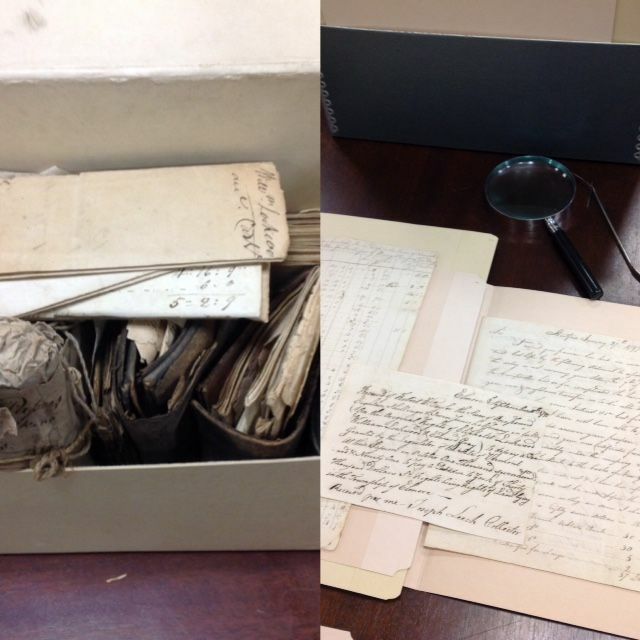 The project is a joint effort of Special Collections and the Preservation Department. Lockwood family papers. Before treatment (left) and after (right). Special Collections, Stony Brook University Libraries.